Thundurus Therian in game: 1,342 Who? Important notice! Pokemon Thundurus Therian is a fictional character of humans. Thundurus (Japanese: ????? Voltolos) is a dual-type Electric/Flying Legendary Pokémon introduced in Generation V.
Along with Tornadus and Landorus, it is a part of the Forces of Nature. In Incarnate Forme, Thundurus is a blue, muscular humanoid Pokémon, which resembles a genie. It is a male-only species with no female counterpart. On its head is a single, long, sharp, purple horn. Thundurus has white, zigzagging and jutting styled hair, a spiky white mustache and two pointed blue ears on either side of its head. Its eyes are yellow with beady white irises and no visible pupils. 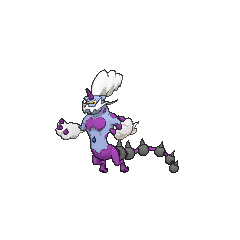 The front of Thundurus's body is covered in various, irregularly shaped purple spots. Its broad chest consists of two joined, purple, rounded-diamond shaped pectorals and its shoulders, elbows and navel are adorned with raindrop like designs. It has two spotted muscular arms, with five fingers on each hand. Its lower body consists of a trailing cloud, with a thick, long, curling, purple, cable-like tail. Spanning the length of its tail, Thundurus has several ball-like structures. They are a dark grey color, and each has a long, sharp spike on one side. In Therian Forme, Thundurus is a large, blue, sleek, bipedal snake or dragon-like Pokémon. The horn on its head is now thicker and extends out more, while its ears become more pointy and pinned back. Thundurus's hair remains the same; the mustache now takes on a more raised snout and fanged-maw-like appearance, with two curving wisps flowing back and past its ears. Its eyes remain yellow, but with larger irises which still lack visible pupils. its chest remains broad and unchanged, while its navel is bejeweled with a blue gem. Thundurus's arms have lost much of their muscular bulk, and are now slimmer. It has two paw-like hands, each covered in a trailing cloud-like fluff and with three claw-tipped fingers. 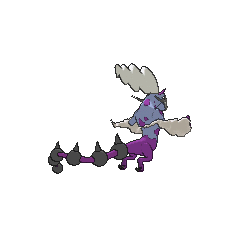 Thundurus's purple lower half is much smaller than its upper body, and consist of two hind-legs and its tail. Its feet are elongated, with three downward curved toes and claws. Thundurus's tail also remains largely unchanged, although it is thicker at the base and tapers off and becomes thinner toward the tip. Thundurus can shoot thunderbolts from its tail. A Thundurus made his TV episode debut in Stopping the Rage of Legends! Part 1 and Stopping the Rage of Legends! Part 2. It appeared on Milos Island after Team Rocket destroyed its shrine, then began fighting with Tornadus. Later, when Landorus tried to stop them, they fought Landorus together, even after Jessie, James, Meowth and Dr. Zager tried to capture them. 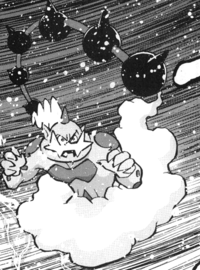 Thundurus made his debut in a cameo appearance in the credits of Black—Victini and Reshiram. 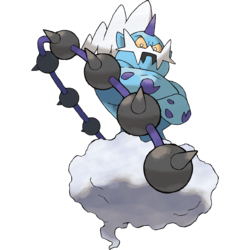 Thundurus made his first appearance in Nimbasa City, where he shocked Black after the Nimbasa Gym's roller coaster was sabotaged and forced him to the Gym's roof. Later, Thundurus got in a battle with Tornadus near the Battle Subway. After being stopped by Landorus, the three were captured by Giallo for Team Plasma to use. Later they were used by the Shadow Triad against the Gym Leaders. These Pokémon were than given to Hood Man (Colress) to experiment how to change them to their alternate forms. Moves marked with a superscript game abbreviation can only be bred onto Thundurus in that game. He is Tornadus's fighting buddy. In the past, they got into a lot of trouble together, and Landorus yelled at them. He lives a quiet life now. 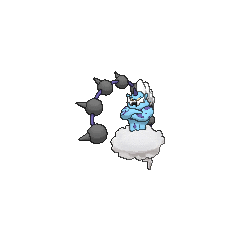 For other sprites and images, please see Thundurus images on the Bulbagarden Archives. Thundurus and Tornadus have identical base stat distribution in their Incarnate Formes. 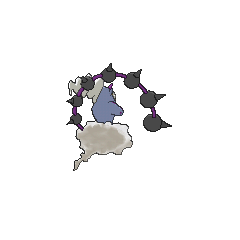 Thundurus's category, the Bolt Strike Pokémon, shares its name with the move Bolt Strike in both Japanese and English; however, it cannot learn the move, which is Zekrom's signature move. Thundurus is the only one of the Forces of Nature that has a type advantage over one of them. 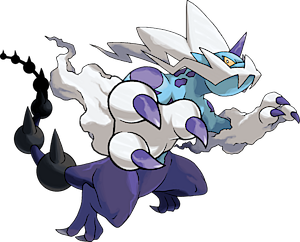 Prior to Generation VI, Thundurus's Therian Forme had the same body style as its Incarnate Forme. Therian Forme Thundurus is the tallest Electric-type Pokémon. 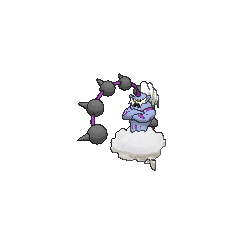 In Incarnate Forme, Thundurus may be based on Raijin, the kami of thunder and lightning. It may also have drawn inspiration from genies. 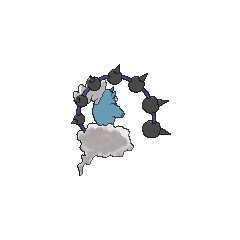 Thundurus is from thunderous and possibly Aeolus, ruler of the winds in Greek mythology. Voltolos is derived from volt and Α?ολος Aiolos (Greek name for Aeolus). Mandarin Chinese ??? / ??? Léidiànyún Means "Lightning cloud"